Posted on Thu, Jul 25, 2013 : 2:03 p.m.
Ann Arbor police detectives continue to investigate the death of Paul DeWolf, a 25-year-old medical student found Wednesday in his apartment on North Ingalls Street. The 25-year-old University of Michigan student found dead in his off-campus apartment Wednesday is Paul DeWolf, a Schoolcraft, Mich., native. Ann Arbor police are investigating the case as a “suspicious death” and an autopsy is scheduled to be performed Thursday. The cause of death is expected to be released after the preliminary autopsy report is complete. Medical school officials and University of Michigan Health System Director Ora Pescovitz sent emails to the medical school community Wednesday confirming DeWolf’s death. Police have not confirmed DeWolf's name to AnnArbor.com. DeWolf's family has been notified of his death. Police said DeWolf worked at the Veteran’s Affairs Hospital in Ann Arbor. When he didn’t show up for work Wednesday morning, the hospital sent a colleague over to his home in the 200 block of North Ingalls Street. That colleague discovered DeWolf's body and called police. Investigators responded at noon Wednesday to a home in the 200 block of North Ingalls Street after the call. 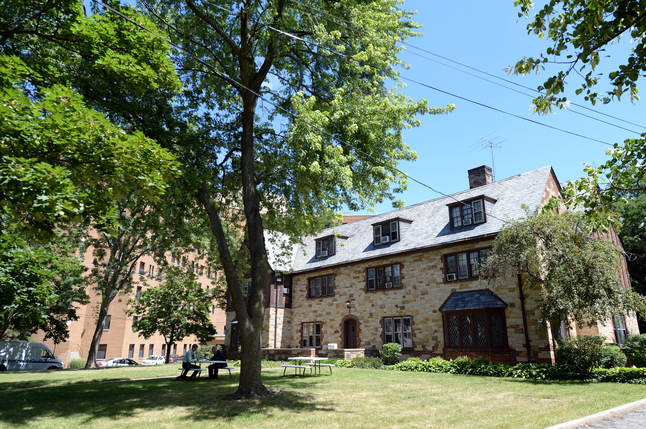 The building is home to Phi Rho Sigma, which is a co-ed medical school fraternity. Counselors are available for students and friends of DeWolf, according to an email from medical school Dean James Wooliscroft and Associate Dean Joe Kolars. “All of us join in mourning his loss, and extend special condolences to his family and those who knew him well,” the email stated. According to DeWolf’s Facebook profile, he was a 2010 graduate of Grand Valley State University, where he was a member of the Sigma Phi Epsilon. Not many official details have been released by police at this point. A report from WWMT in Kalamazoo said Ann Arbor police confirmed DeWolf was found in a pool of blood in the apartment. A message was left with DeWolf’s family in Schoolcraft by AnnArbor.com Wednesday. Residents at the home on North Ingalls declined to speak with a reporter Thursday afternoon. Jen Hemberg met DeWolf when she started at U-M Medical School in the fall of 2010 and often worked with him in discussion groups in class. She said students in her class were immediately impressed with DeWolf when they heard he graduated from Grand Valley. DeWolf was a “perpetual athlete,” Hemberg said. The former track athlete ran often and was a member of an intramural volleyball team, where he convinced his teammates to wear gold lame' shorts in order to intimidate opposing teams. “That is like the epitome of Paul,” she said. Hemberg said DeWolf often played bartender at parties at Phi Rho Sigma, but didn’t drink often. He was working toward becoming a surgeon and had an intense fourth year of medical school ahead of him. He was set to graduate with Hemberg and the rest of their class of 170 students on May 16. The news of DeWolf’s death came to Hemberg and other medical students Wednesday afternoon. Hemberg and other students who knew DeWolf spent much of Wednesday afternoon in tears after being told about his death, she said. As his friends and family wait for answers, Hemberg said many will focus on the way DeWolf made them smile and laugh and lament he won’t get the chance to become the doctor he trained to be. “He was so excited to graduate and become a surgeon,” Hemberg said. Anyone with information on this case is encouraged to call the Ann Arbor police anonymous tip line at 734-794-6939 or Crime Stoppers at 1-800-SPEAK UP (773-2587). Read more about DeWolf in this report from MLive. Thu, Jul 25, 2013 : 11:46 p.m.
&quot;A message was left with the family&quot;...I hope it was a message of condolences rather than expecting a statement. This family is reeling with a devastating loss and should not be expected to comment. Please wait for the professionals to update you rather than bother the family. My thoughts and prayers are with the DeWolf family. Thu, Jul 25, 2013 : 8:43 p.m. I've added a link into the bottom of this story to a report from our colleagues in Kalamazoo. There's more interesting detail about Paul in there and I encourage you all to read it. Fri, Jul 26, 2013 : 2:18 a.m. They say it is a homicide. But have they also ruled out drugs? Or something that may have contributed to his death? Seems like we are going to loose another generation of young folk. Thu, Jul 25, 2013 : 8:19 p.m.
For those who read the shorts detail: Our system does not allow accent marks in the HTML, which is why the apostrophe is after the e.
Thu, Jul 25, 2013 : 8:01 p.m. It would be a standard protocol for a good friend which he apparently had many. Tragic, condolences to the family. Thu, Jul 25, 2013 : 7:28 p.m. So sad to lose a young man with his whole life in front of him. My condolences to his family and friends. I'm confused by the two paragraphs I pasted below??? Did he just graduate or is this NEXT May he would have graduated? He was working toward becoming a surgeon and had an intense fourth year of medical school ahead of him. He was set to graduate with Hemberg and the rest of their class of 170 students on May 16. &quot;He was so excited to graduate and become a surgeon,&quot; Hemberg said. Thu, Jul 25, 2013 : 7:34 p.m. He was a fourth year medical student, and as such, would have graduated in May of 2014 with the rest of his class. The new academic year for the fourth year med students starts in May each year, so he just started his fourth year this past May. Thu, Jul 25, 2013 : 7:31 p.m.
Thu, Jul 25, 2013 : 7:12 p.m. Thoughts and condolences to the family and friends. I am curious, is it standard protocol for a place of employment to send someone to check on an employee who doesn't show up for work? Thu, Jul 25, 2013 : 8:54 p.m. I've managed many apt complexes, and occasionally we would have people ask us to check on a tenant. I hope someone would do it for me! Thu, Jul 25, 2013 : 7:48 p.m. I don't know how often co-workers are sent to check up on someone when they don't show up for work, but a dear friend of my was found the same way. She didn't show up for work. Her boss and another senior colleague went to her home and found her dead. She was one of those people who always went to work, and she worked very hard. This didn't happen in Michigan. I feel sorry for the young man's family and friends. People shouldn't die that young. Thu, Jul 25, 2013 : 7:46 p.m. There are many places of employment that would check up on behalf of a missing, dependable associate who is not answering his phone, and especially if it were known that the family was not nearby to do so. Thanks for the replies. For the record, I was not making any kinds of insinuations or assumptions. I was just curious. Thu, Jul 25, 2013 : 7:30 p.m.
A Medical student is not an employee. He was a student who had not yet graduated, sadly. Thu, Jul 25, 2013 : 7:26 p.m. It is when that person is a 4th year medical student who doesn't have a history of unexplained absences. He wasn't really an employee at the VA, but rather a medical student doing clinical rotations. It is also my understanding that the person sent to look for him was a person who also lived in the same house. Thu, Jul 25, 2013 : 7:02 p.m. Thoughts and prayers are with his family and friends as they grieve. Such a tragic loss of a bright young life.